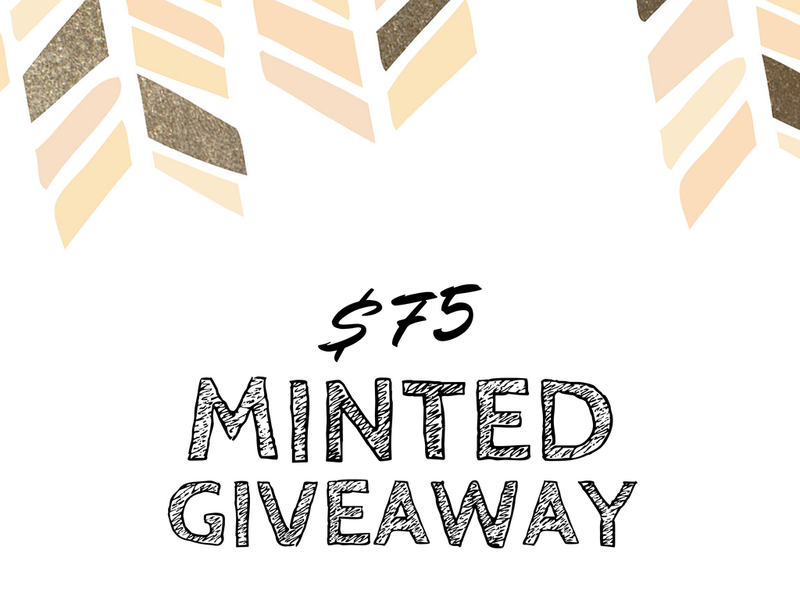 This month I am co-hosting with Beth of Oak + Oats to bring you a $75 credit to Minted. We both love Minted a whole lot and order many products from them. Beth has used them for her family Christmas cards and buying prints for her home office, and we've both ordered our business cards and stationary from them. The quality of each of their products is superb, and I highly recommend Minted for all of your pretty printed needs! I am swooning over basically every stationary option Minted has, but if I have to pick just one to re-supply my stationary stock, this arrow head design might take the cake. Check out the new foil pressed collection and tell me which is your favorite! P.S. Minted's new holiday collection is also being released soon, so stay tuned for that!! It is never too early to start planning for your perfect holiday card! P.P.S. You can get $25 off your first order with Minted by clicking here! I love so many things from Minted. I need a new journal for the conferences next month, but I can't decide which one! And omg the pretty business cards! Minted is my favorite! What a great giveaway! I am a bit of a journal hoarder, so I would love to add a couple more to collection! My favorite items are the Hello Business Cards and Hello Stationary! Great giveaway! SO loving this as well! $75 to Minted would be SO FUN to spend!! And so easy. And so good. I love the Merry Typography Christmas card! I LOVE their photo cards! With a new baby on the way, they would be the perfect way to announce the little bebe! I love everything!! Haha Their autumn line and menus and stationery are wonderful! Oh my their business cards are to die for! And it would be super cute to have some of those stickers for when sending out cards instead of having to lick to every single one. Oh goodness, Minted is everywhere this week! I heard about their foil-pressed line on another blog earlier this week and definitely agree, it makes everything so fancy and fun! :) I've been thinking about getting blogging business cards and love all of their options (aka I can't choose just one!). but any hello gold foil would also be so amazing! Thanks for putting this giveaway on! I love the Hello Friend foil-pressed personalized stationary, the Oh So Peachy polkadot foil-pressed biz cards and the personalizable photo backdrops. So much to love! I love the Snowy and Bright photo Christmas pic...our 2nd babe is coming in December and I can;t wait to have pics done and Christmas cards/announcements sent out!! I love the "Poppy Talk" and "Indio" stationary. If I got them, I would be much better at keeping up with people, right? I love Minted's save the date cards, especially the Swoon save the date card! Their Christmas cards are my favorite! I have a son graduating this year so I love their graduation cards - especially the Windows one. I love this kitchen theme couples bridal shower!! Super cute! The Havest Moon prints are gorgeous! Love the stationary too especially the striped lines personalized stationery.